Why You Can’t Leave a Legacy for your Children. Have you ever sat down to ponder, what would happen to you as a parent right now in another couple of years? Have you ever wondered, woken up in bed, deep in thought, about the future of your kids, your family? Have you ever wondered and been bothered about securing the future in the best way possible? Am sure you have seen your parents hustle to put you through school from primary to secondary to university and you see them now, retired, bemoaning their years of service, their gratuity, and the peanut pension they receive. You don’t need a soothsayer to let you see what pensioners go through in our nation. And you don’t need a prophet either to see yourself, embarking on the same path. You ask yourself the question, what can I do to safeguard the future, my future, to provide adequately for my family. It’s a valid question, troubling every young family right now, every young man and woman who is genuinely responsible. We start hustling, looking for multiple streams of income, changing jobs in hopes of higher pay, trying to be entrepreneurial, and working 24/7 much to the detriment of our health. Have you checked the obituaries recently and taken note of the statistics of young, bright individuals that drop dead like flies everyday due to one ailment or the other. Most times, even unknown ailment. Alright, enough of the gloomy picture. But do you know that, there are little investments you can do today, that would look ridiculous now, but astounding tomorrow? There are different vehicles you can use for these investment, but I will dwell on one today. An elderly Lady once shared this story with me. She said, “where Adebola house is right now, I was offered to buy that land for N20,000 about 15 to 20 years ago. And I thought, who would buy a land in a swamp?” The answer am sure we all know it. And am certain we have heard similar stories in the past. Opportunities to buy land often come our way but we tend to ignore it, over analyse it, and end up with paralysis-analysis of us not doing anything until we bite our fingers years down the line. Oh there are fake estate companies, fake land, “omo-onile” issues, bla bla bla and we want to wait till a bigger, mega opportunity comes and we become stymie over our inability to buy. 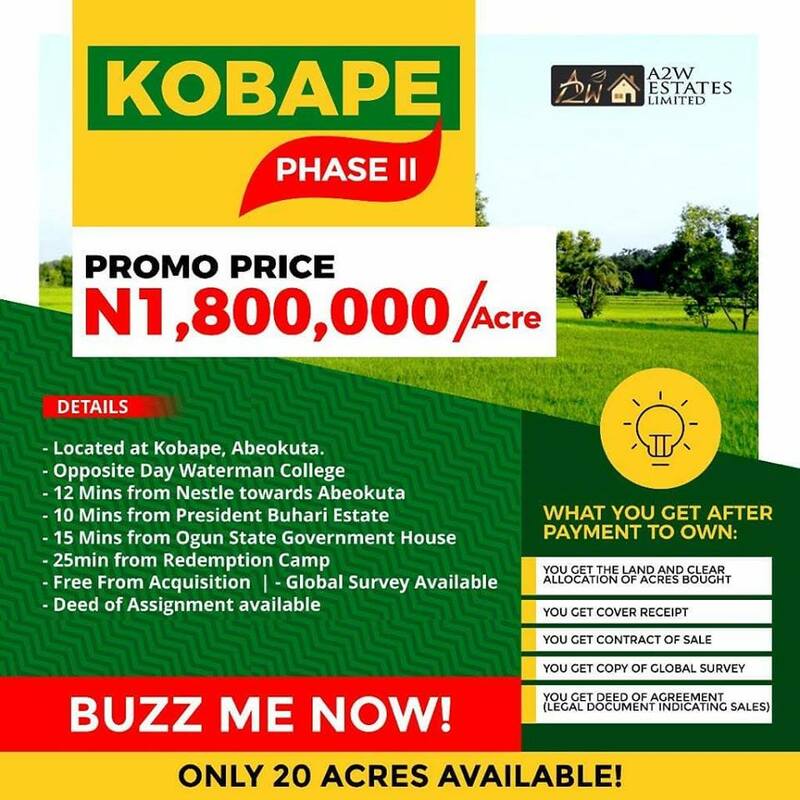 An opportunity exists for us to be responsible for our future, and that of our children by buying a plot of land for just N200k now at a location very close to Siun after Kobape opposite Day Waterman College on Abeokuta-Sagamu Expressway. Ohh its outside town! Yes it is. Lekki-Epe used to be outside town. Shimawa, Mowe, Ofada, Berger axis all used to be outside town and outskirts. Tried buying a land there today? Am sure….you will flee! The truth is, you can buy cheap today and get rich selling! Or better yet, buy cheap, and have your children’s school fees to Havard 😉 secured! And a legacy secured for your family! Don’t be on the “I told you so” divide. Be on the “I own one” divide! Now is the time to secure that plot of land at Kobape, Abeokuta and don’t just read this click to signify interest now and lock it down!